"This is an easy way to serve great vegetables with your meal. 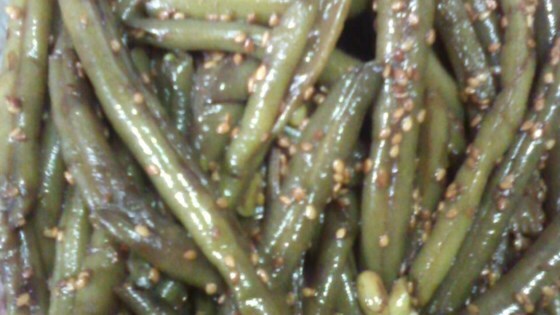 Green beans are stir fried in vegetable oil and soy sauce, then sprinkled with toasted sesame seeds to create this surprisingly easy, tasty, and impressive side dish." Toast sesame seeds in a large dry skillet over medium heat until they turn golden brown. Spread out onto a plate and allow to cool. Heat vegetable oil in a large skillet over medium-high heat. Add green beans and soy sauce. Cook, stirring constantly, until the beans are hot and tender, about 10 minutes. Season with black pepper to taste, and toss with toasted sesame seeds. Needs less oil, soy sauce and especially sesame seeds or more green beens and it will be great. Good flavor. Try mixing part sesame oil and part vegetable oil. I added a little sesame oil to finish along with a few tablespoons of broth. The recipe was delicious and very simple to make. We did everything as suggested and it turned out good.